4to. Four volumes. Two tables (one folding) in volume two. Contemporary mottled calf, spines gilt, red and black morocco labels. Joints of first volume cracked but secure, minimal repairs to joints, minor wear and foxing. A splendid, tight set in a wonderful period binding. “All our formative documents—the Declaration of Independence, the Constitution, the Federalist Papers, and the seminal decisions of the Supreme Court under John Marshall—were drafted by attorneys steeped in Sir William Blackstone’s Commentaries on the Laws of England. So much was this the case that the Commentaries rank second only to the Bible as a literary and intellectual influence on the history of American institutions” (Robert Ferguson). 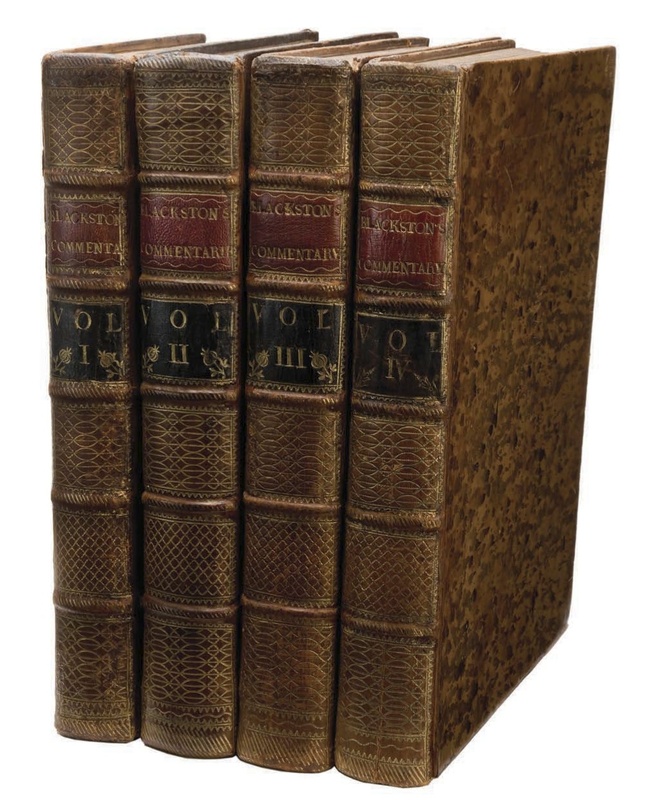 A set of Blackstone’s Commentaries is a cornerstone of any library of the history and thought of the Founding Fathers. Fine copies in original bindings are virtually unobtainable. This splendid set, in a shimmering gilt-tooled calf binding of the period, is worthy of the greatest libraries. Printing and the Mind of Man 212. Grolier 100 English Books 52. BLACKSTONE, WILLIAM. A Discourse on the Study of the Law. Contemporary marbled wrappers, inscribed “Duplicate.” A fine, untrimmed copy. First edition. This is Blackstone’s inaugural lecture as the first Vinerian Professor of English Law, delivered in October 1758. The lecture, which emphasizes the value of the study of law at university, has been called a “sensible, spirited, and manly exhortation to the study of law” (Sheppard, History of Legal Education in the United States). Rare: no other copies appear in the auction records of the past forty-five years. This is an excellent, untrimmed copy.